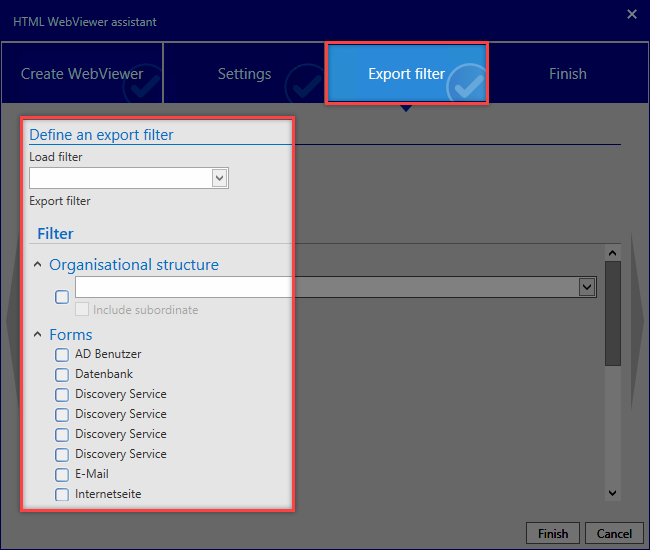 What is a HTML WebViewer export? The HTML file is created on the user*s client and started in the Main menu under Export WebViewer. 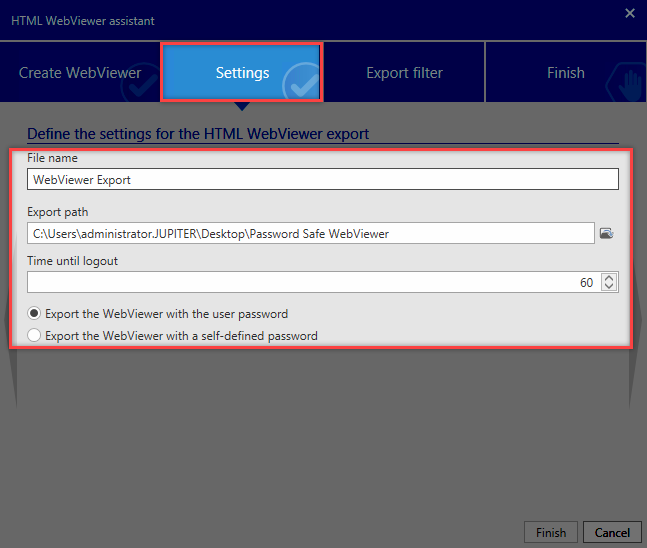 The HTML WebViewer Wizard carries out the * WebViewer export*. General information and notes about the export are displayed under Create WebViewer. General information such as the Name and Export path for the HTML file can be entered here. 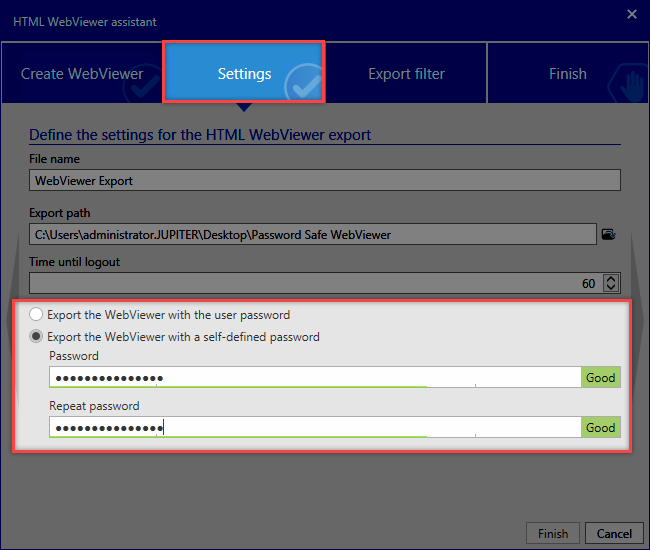 Export WebViewer with user password or new freely definable password: You can decide here whether to issue a new password for the export. If an Active Directory user is carrying out the * WebViewer export*, a password needs to be explicitly entered. The export filter works in the same way as the filters for the modules. The information about the exported passwords is displayed in the Finish ribbon. Clicking on the Finish button will then create the HTML file in the export path and close the window. A subsequent note provides you with information about the export process. The HTML file is created in the export path and can be copied to a mobile data medium (USB stick, external HDD, …). 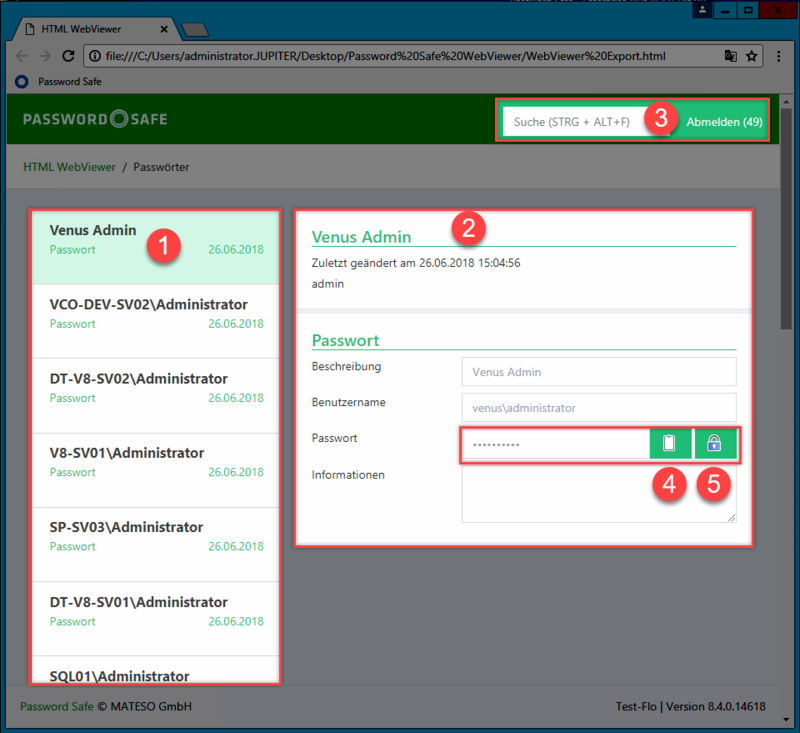 The HTML file can be opened in a standard browser and displays the Password Safe – HTML WebViewer / Login when started. The database and the user name are predefined. The user *password is used for the login. !The login mask is blocked for a period of time if the password is incorrectly entered! After logging in to Password Safe, the overview page for the *HTML- WebViewer * with the passwords is displayed. *Use the password search function in the event of more than 20 passwords! You can log out by clicking on Logout. In the event of a longer period of inactivity, the user will be *automatically logged out after a set period of time has expired *(time until logout). *You have been logged out due to inactivity. The browser will then show the Password Safe – HTML WebViewer / Login again and also the reason for being logged out. It is possible to log in again.